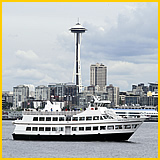 Two downtown cruise terminals and convenient air travel connections make Seattle the preferred choice for Alaska or Pacific Northwest cruises. Select from 11 premier ships for your cruise adventure. In 2015, Seattle will host 192 cruise ships and more than 895,000 passengers. Passenger Information: The Bell Street Pier Cruise Terminal and the Smith Cove Cruise Terminal are Port of Seattle facilities managed by Cruise Terminals of America (CTA). For info about parking, concierge services or other passenger amenities or questions about promoting products, services or attractions to cruise passengers. On Board Airline Check-in: Check-in for your flight home while still on your cruise ship! Visit Guest Relations on your ship to get your airplane boarding pass and details on luggage handling. A great option if you have a late flight home and want time to see Seattle...without your bags! Concierge: The cruise terminal concierge offers luggage storage after cruises, plus city information. Hours of operation are 7:30 a.m. to 3:30 p.m. on cruise days only. Rental Cars: A rental car information representative is available at the cruise terminal on cruise days. Passengers will be transported to rental car locations for vehicle pick-up.